Fioravanti is a means of transport design company, mainly involved in the automobile field, which is recognized for its "out-of-the-box" thinking. Thanks to this characteristic combined with the strong passion of its personnel, for the 79° edition of the Gèneve International Motor Show, Fioravanti deals with the topic of Formula 1. Since we think that in a period of heavy economic crisis, in particular for the automotive world, also the Formula 1 has to be reviewed in its principle. Creating more connection between the F.1 research the road cars production, making the races more interesting with more overtaking manoeuvres still maintaining the Grand Prix a the top of the media global events. LF1 wants only to be an AUSPICE for a future Formula 1 regulation, based on more general simplicity, with it Fioravanti shows one of the possible solutions. The vehicle has been designed referring to the next 1.800 cc. turbo engines as recently proposed for the 2012 regulations. With this has been possible to define a very compact bodywork with less aerodynamic drag and turbulences. Radiators and intercoolers are designed with forced air using fans in order to reduce the front wheels drag. 18” rims and tyres with dimensions more similar to the road and racing GT cars, allowing the use of braking systems similar to the ones utilized in the high performance road cars. Advanced use of the K.E.R.S., as in the production cars, more eco-oriented for fuel consumption saving. This topic over the years has became more and more relevant in Formula 1, affecting performances, costs, racing and the aesthetic. The inspiring principle of the project has been the reduction of the aerodynamic drag and turbulences. 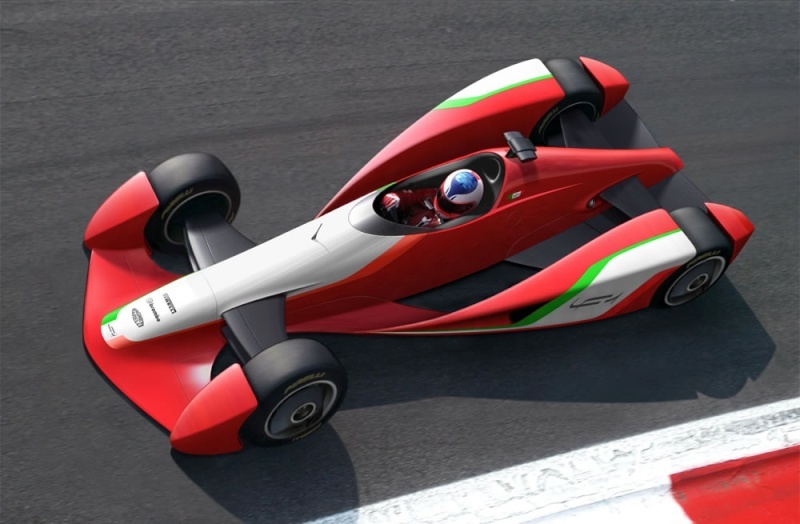 This goal has been reached taking advantage of the ground effect in an innovative manner, removing the wings as not integrated bodywork elements. The shape of the central body is characterized from lift-down force ratio close to zero. The front wing is integrated in the front end and contributes at the same time for the down force and for the reduction of the front wheels drag thanks to the side fairings. The rear wing, with quite big dimension, is integrated in the bottom of the vehicle generating consistent down force. In order to give an optimal ground effect and to keep the vehicle with a constant distance from the ground , we propose a return of the active suspensions use, widely utilized in the production cars. The C.F.D. (Computer Fluid Dynamic) study has confirmed that, with a measurement done at 10 meters from the back of the car, the degree of the turbulences generated by the aerodynamic drag is very low. Considering the above it could be possible to suggest, at regulation level, the check of the drag energy and degree of turbulence in a transversal section positioned 10 meters from the rear of the car. This could allow drivers to do more overtaking in all the circuits, giving them the possibility to decide, more than today, when and how to overtake, allowing battles between several cars and driving tactics that emphasize the driver talent. Dimensions: length 4.200 mm. height 950 mm. Width 1.820 mm. wheelbase 2.800 mm. Fioravanti, this year in its 20th anniversary of activity, continues the research on the new architectures of the next future vehicles that will must face the new alternative sources of energy and their stockpiling. Hidra is the evolution of last year Thalia and marries the Fioravantis propensity for innovation, functionality and elegance. Hidra is a proposal of a sporty multifunctional vehicle ( M.P.C. as multi purpose coupe), with 5 doors and 4 seats. The concept is based on a general layout that lets reach notable results in terms of vehicle dynamics, passive safety and flexibility. 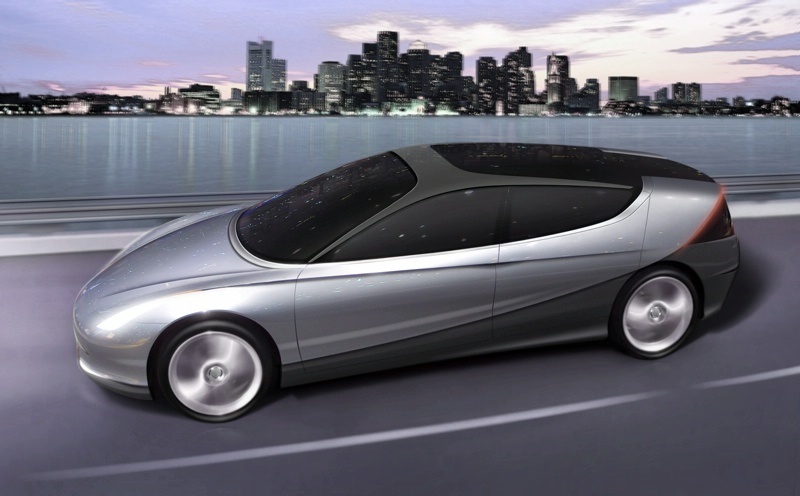 Its foreseen a central-longitudinal area creating room for hydrogen tanks, for a fuel cell car or for possible batteries in the case of electric or hybrid engine. These large masses would be placed in a well protected area, safe from crashes and low for an ideal centre of gravity to improve the car handling. Thanks to this layout, Fioravanti proposes, for every single wheel, its own patent concerning the possibility to use an only-one identical type of suspension. A sleek and dynamic design characterizes the unique bodywork with modelled and plastic surfaces, in the vehicles front end we find the lights, which are luminous volumes that vary their intensity depending on functions, creating a single drawing. The rear area shows an extensive transparent surface that includes an innovative system for the retro-illumination of the number plate thanks to the oled technology, in the original rear bumper we find: rear lights, turn indicator, fog light, reversing light. The big H on the roof is an aesthetic innovation but specially a functional innovation, it born at the origin of the A pillars and finish at the C pillars. Its horizontal part is, aerodynamically speaking, in a depression zone and its shape helps to keep the flows attached to the body. The frame of the big H, where acts as perimeter of the windshield, shows a series of jet that alternatively and/or simultaneously spray water and air. This idea is the last revolutionary patent of Fioravanti and its called Geyser. Its a new system for the cleaning of the transparent surfaces in every possible condition without using more the windshield wipers. 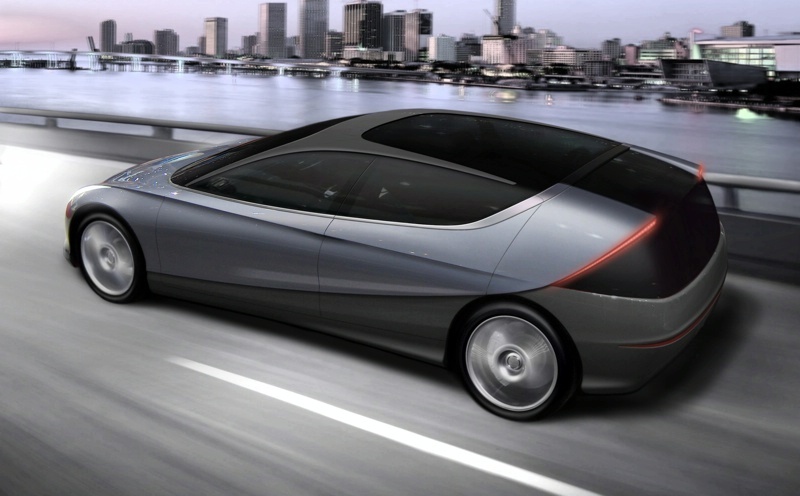 The patent is based on the combined use of: nano-technology, aerodynamic, water recovery from the fuel cells.